I tend to buy an app for the iPhone, and then play the everliving heck out of it for a few weeks… and then it shifts into the background, and I play with it on occasion. Some examples of this are: Plants Vs. Zombies, Card Shark, Dice Break. Recently I got two extremely different games at about the same time, and now I find I like to play them off of each other. 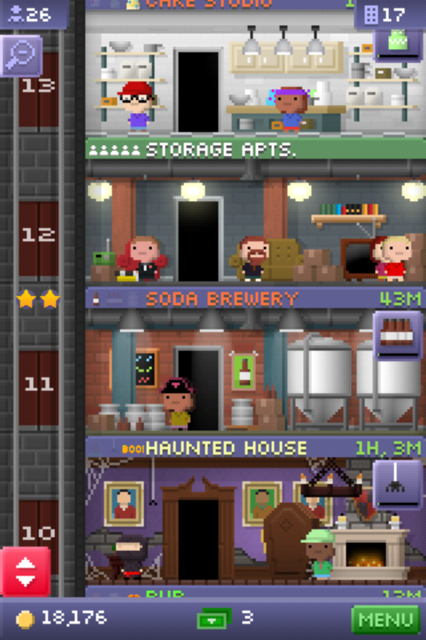 First up is Tiny Tower. I was a fan of the old Sim Tower game for the PC, a single building take on the Sim City model of undirected building and feedback processes. Unlike the more complex Sim Tower, Tiny Tower is quite straightforward: you are managing a building in which little people (in the parlance of the game, Bitizens) live and work. Every floor is either a group of five apartments into which Bitizens move, or a business where Bitizens can work. Two things make this game particularly enjoyable to me. First of all, in an age of retina displays and super-advanced 3D modelling, everything in Tiny Tower looks like it was coded in 1983. The “pixels” are enormous. The character designs are just barely recognizable as human. Second, there are so many possible businesses, it’ll take a crazy-long time to find dream jobs for all my tenants. But, since one of the Game Center goals is a tower of 100 stories, I guess the app is nicely scalable. I’m not the guy who ever buys add-on credits for a game like this. I know, that’s the business model, but, screw it, I’m not paying $5 to make the elevator go faster. I will just wait for my Bitizens to make their multi-tier cakes and cold medicines. And while I wait, I’ll play Zombie highway. Where Tiny Tower is charmingly low-tech, Zombie Highway is a driving/shooting game with some decent animation (though I doubt there’s anything groundbreaking about it). In this game, the look and feel is more nuanced, but the game-play is simple. Imagine a zombie movie that takes place outside the city. Now, imagine there’s an action sequence where the heroes are trying to get from Point A to Point B, and zombies keep jumping onto the vehicle to pull it off the road. They have a limited amount of ammunition, and they have to avoid all the wrecks on the highway, so mostly they try to scrape the zombies off the car by crashing into stuff. That’d probably be the coolest scene in the movie. 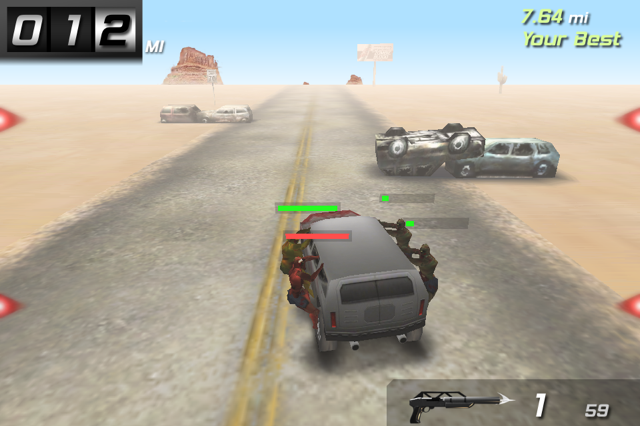 Zombie Highway is the game version of that scene. And that’s all it is. Drive, don’t crash. Your score is the distance you’ve driven. There are cars to unlock, and weapons to access, and new levels to get to (a swamp, a frozen wasteland with Ice Zombies!) but the essential game is just that. You steer by tilting the phone, and you shoot by tapping. It has excellent replayability, partly because I haven’t yet mastered how best to steer to counteract the yanking of the stronger zombies, but it’s also a game that doesn’t limit your advancement by making things get too difficult too fast. Maybe after I’ve gotten a Gold Medal on every scenario and unlocked all the weapons, the game will begin to bore me, but for now, I’m really enjoying killing zombies with my car while I wait for my Tiny Tower Bitizens to brew up a new batch of specialty soda. I’m a fan of video games, but I don’t immediately try out every one that comes down the pike. Never played Halo. Never played Assassin’s Creed. Never played Call of Duty. But a good hack and slash game with some online capability? That I like. I always loved Doom and Castle Wolfenstein. 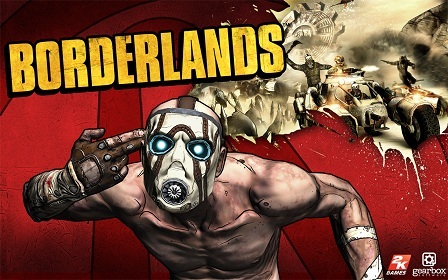 So, at the urging of both of my brothers, I picked up a copy of Borderlands. Long story short, you’re a treasure hunter in a post-apocalyptic hellscape of bandits and mutant creatures, looking for some lost “vault” of immeasurable treasure. If you like this kind of action, it might be worth a look if you can find a copy for $20 like I did.